When fighting a war, soldiers and their leaders are not mere instruments, automatons or programmed killing machines. Even in battle, they remain capable of making moral judgments and retain responsibility for their decisions and actions. Abiding by these principles is what separates legitimate killing from butchery, murder and massacre. Americans expect their soldiers and leaders to protest commands that would require them to violate the rules of war. Few doubt the validity of this, the tactical dimension of the morality of war. Some doubt, however, that senior military leaders who wage war also remain moral agents. Others so severely restrict the scope of the moral agency of senior leaders that even the hint of resignation over principle is thought to be a threat to civil control of the military. Such restricted perspective of the strategic dimension of the morality of war needs closer examination. Moral agency. Eliminating doubt of one’s moral agency, your ability to make judgments based on your notion of right and wrong, is relatively easy. All human beings are morally responsible for their actions, for moral agency is part of the very definition of being human. There are exceptions, such as mental, emotional, or physical deficiency or youthful inexperience, and exceptions may properly extend to people under extreme duress—like the “gun-to-your-head” situations—who cannot be reasonably held responsible for their decisions and actions. These exceptions, however, prove the rule: Most people under most situations retain their moral agency and can be held responsible for their decisions and actions. Putting on a uniform, even in combat—whether that uniform has on it stripes, bars or stars—does not erase one’s moral responsibility; neither does wearing a suit and filling a position of responsibility in government. 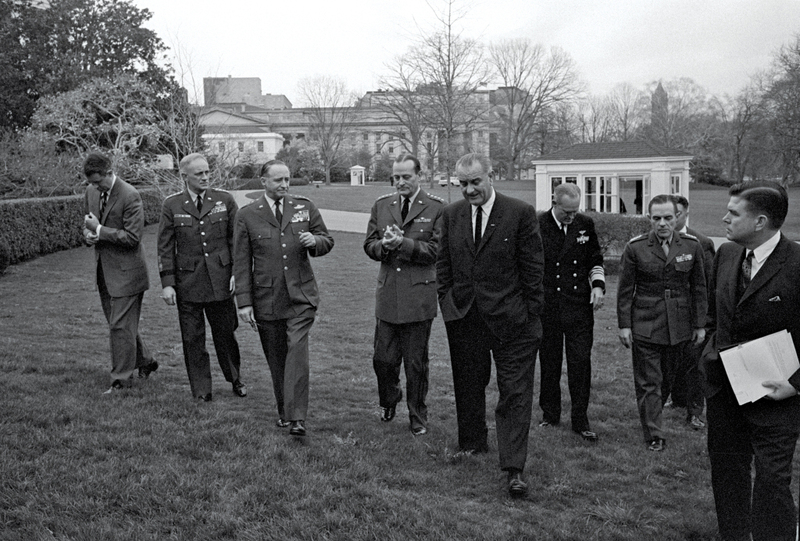 The Joint Chiefs of Staff cross the White House lawn with President Lyndon B. Johnson in April 1965. Gen. Johnson is second from left. Leaving a position of significant responsibility is difficult. Deception is very strong, as is co-opting. As Albert O. Hirschman wrote in Exit, Voice, and Loyalty: Responses to Decline in Firms, Organizations, and States, any “final policy decision can always be made to look as some middle course between the two opposing points of view … hence [all] are always made to feel that ‘if it had not been for me, an even more sinister decision would have been taken.’” The desire to remain close to power is also very strong: “Power corrupts; and even a little influence in a country with huge power can corrupt hugely.” Finally, the organization itself may have formal or informal norms that treat either dissent or resignation as disloyalty, even treason or mutiny. These kinds of norms are very powerful and pose significant difficulty to those considering major criticism or resignation. Such difficulty is natural; concluding to resign should be hard. Difficulty, however, does not set aside a senior leader’s responsibility to his or her conscience or responsibility to the larger institution and the nation that those leaders serve. Loyalty sometimes requires criticism. To operate properly—and especially in war—the nation to which a senior leader is loyal needs to know when its war aims, strategies, policies and military operations are failing. Without this feedback, the nation diminishes its chances of recuperating from deteriorated performance. With respect to senior military leaders, however, resignation or criticism must be exercised in a way that does not challenge civil control of the military: “candidly and privately,” in the words of former Defense Secretary Robert M. Gates—at least for senior military leaders. 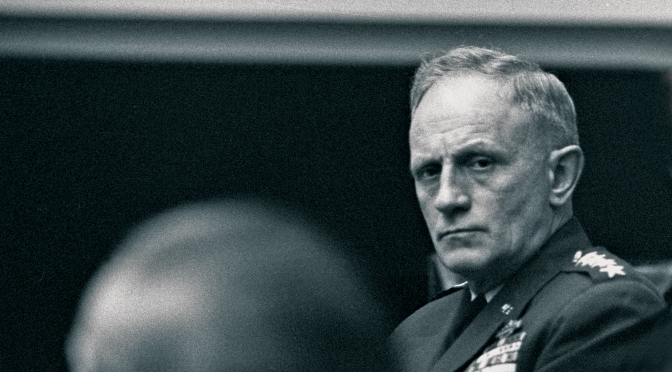 Mass resignations of senior military officials like that considered by the Joint Chiefs during the Lyndon B. Johnson administration, or a public resignation like Gen. Johnson’s would have been, are problematic because of the threat to civilian control. Dissent seems to have a recognized place with respect to senior political and military leaders, but not resignation. Richard H. Kohn, for example, rejects resignation even if kept private. In American Civil-Military Relations: The Soldier and the State in a New Era, he wrote, “Resignation—even the very hint of it, much less the threat or the act—is a direct assault on civilian authority. Civilian officials rightly interpret it as such. It inherently violates civilian control.” Kohn believes that all lawful orders, even if immoral, are to be followed. Kohn correctly points out that “even military officers at the very top of the chain of command … cannot know all of the larger national and international considerations involved, a calculation that belongs properly to the political leadership, elected and appointed. Nor is there historical evidence that military judgment has been superior to that of the politicians.” The scope of the president’s responsibility is larger than the scope of a general’s. That’s why resignation over mere disagreement or the feelings of being ignored, disrespected or treated badly is wrong. A conclusion to resign cannot be taken this lightly. 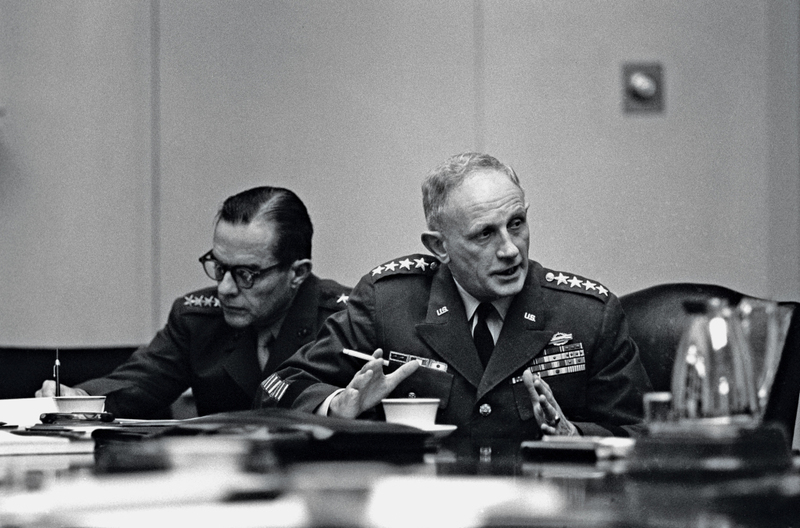 Johnson, right, and Marine Corps Commandant Gen. Wallace M. Greene Jr. discuss Vietnam at the White House in 1965. Neither was his issue whether he believed that he must obey distasteful or sometimes disastrous orders. He knew that he must—after all, he fought the futile defense of the Philippine Islands following the 1941 Japanese invasion, was captured and survived the Bataan Death March, Japanese hell ships, and the neglect, brutality, illness and starvation of extended captivity until September 1945. Rather, his was a problem of fact, about what he did know: that the lives of citizens who became soldiers were being wasted. His was a moral problem that involved recognizing first that the value of human life is such that, while war requires that lives are used, they cannot be wasted; and second, that he, his fellow Chiefs, the President, the Secretary of Defense and other senior political leaders are co-responsible for the lives they use. Johnson’s issue was one of moral agency. Absolute prohibition of resignation is unwarranted because it denies the individual moral agency and denies the institution an important recuperative mechanism. Gen. Johnson’s resignation, had he done it privately, had nothing to do with President Johnson’s right as the final decision authority over war-waging decisions. Rather, it had to do with the content of decisions. His resignation may not have changed any of the strategies or policies used in Vietnam, for his replacement may have been less likely to object or more in line with what the President desired. In resigning, however, the general would have been true to his own conscience, to the citizens who became soldiers that he led and to the nation he served. Neither good order and discipline nor civilian control of the military is at risk over the proper exercise of moral agency; rather, it results in a better organizational performance. Soldiers and leaders on the battlefield and senior political and military leaders in the boardroom share several commonalities with respect to their moral positions. Regardless of where they serve, they often find themselves between the rock and the hard place with “the cruelest decisions to be made by the men on the spot,” as Walzer wrote. Whether on the battlefield or far from it, they must sometimes choose between Nagel’s aforementioned “morally abominable courses of action.” And by acknowledging that war places both tactical and strategic actors in difficult moral circumstances, they confirm that they retain their moral agency.